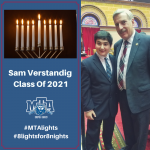 Today’s MTA Light is Freshman Sam Verstandig of Kew Gardens Hills. Sam’s strong leadership skills and determination have shown us what a big difference one person can make. As an 8th grade student at Yeshiva of Central Queens, Sam became the President of Mix It Up, the school’s anti-bullying club. In an effort to secure funding for the club, Sam met with his local City Councilman and learned that as a non-public club, it was not eligible for funding. Sam tried a different route and met with his State Senator, who gave a personal donation to the club and spoke to its members. Taking it a step further, Sam met with his New York State Assemblyman, who donated anti-bullying books for club members to read to younger students. Sam realized the impact he could make if he continued to lobby for the cause. Last January, Sam and his father went to Albany to advocate for anti-bullying legislation. “I like helping others and wanted to be a voice for those who can’t speak up for themselves. I learned a lot on my first trip to Albany, where I went on to the State Assembly Floor, met with the New York State Deputy Secretary of Education, and learned about the education system, including the fact that the Governor proposed a $300,000 budget for anti-cyberbullying legislation that was waiting for approval from the Assembly and State Senate. During recess, lunch, and any other free time I had, I called 150 State Assemblymen and 63 Senators and urged them to approve the funding. In April, I took another trip to Albany, where I was introduced on the Senate Floor. I learned more about how a bill gets passed and met with 10 Senators and Assemblymen and asked them to support the anti-cyberbullying legislation. All of them took me seriously even though I’m just a kid and they agreed to help. Before the bill becomes law, it needs to be passed on both the Assembly and Senate Floors. All 63 Senators voted to pass the bill, which is now waiting to be voted on by the Assembly sometime between January and June, 2018. I plan to return to Albany and advocate for the bill to be passed. In the meantime, I continue to speak with local government leaders about important issues that impact Israel and the Jewish community. I attend Town Hall meetings and speak with the Mayor about these topics. I want other kids to know that they can also make a difference. I recently started the New York Political Action Club at MTA. We plan to go to Albany and lobby for educational legislation and also meet locally with the elected officials who govern our community. I think it’s really meaningful to be an advocate for important issues, even if they don’t impact you directly, which is why I want to pursue a career in politics. I hope to motivate other students to get involved as well.” Thank you, Sam, for lighting the way for our students and giving a voice to those who can’t speak up for themselves.